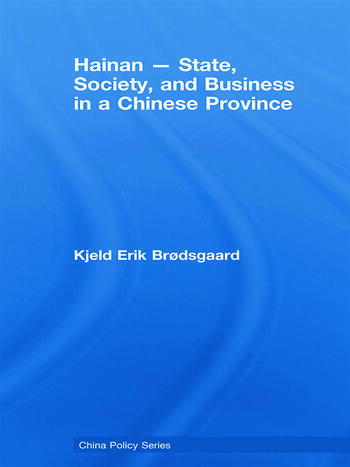 This book examines the complex relationship between the state, society and business in China, focusing on the experience of the island province of Hainan. This island, for many years a provincial backwater, was given provincial rank in 1988 and became the testing ground for experiments of an economic, political, and social nature that have received great attention from Beijing, in particular the "small government, big society" project. This book provides a full account of this transition, showing how Hainan casts important light on a number of highly topical issues in contemporary China studies: central-local relations, institutional reform, state-society relations, and economic development strategies. It provides detailed evidence of how relations between party cadres, state bureaucrats, businesses, foreign investors and civil society play out in practice in China today. It argues that despite the liberalization of recent years, especially in the economic sphere, the party state remains the most powerful actor in Chinese society, and that path-breaking reform experiments such as in Hainan remain highly vulnerable due to the central government’s hesitation to commit the resources and unequivocal political support needed for the experiments to be successfully realized. Kjeld Erik Brodsgaard is Professor and Director at the Asia Research Centre, Copenhagen Business School. He has held visiting research appointments in China, Singapore, and the US and is a member of the Advisory Board of the EU-China Academic Network (ECAN). His most recent publications in English include The Chinese Communist Party in Reform (2006) and Bringing the Party Back In: How China is Governed (2004). He is currently engaged in a major research project on cadre reform, party building and public management in China.